Republican presidential hopeful Sen. Marco Rubio. WEST PALM BEACH, Fla. — Senator Marco Rubio on Friday gave the green light to supporters to vote for Governor John Kasich in Tuesday’s presidential primary in Ohio to help stop Republican front-runner Donald Trump. The unusual tactic comes as the Rubio tries to rally the anti-Trump vote behind his candidacy in his home state of Florida. Rubio said he would not try to persuade Ohioans who think their governor represents the best chance to defeat Trump there not to cast their ballot for him. ‘‘Clearly John Kasich has a better chance of winning Ohio than I do, and I think if a voter in Ohio concludes that voting for John Kasich gives us the best chance to stop Donald Trump there, I anticipate that’s what they will do,’’ Rubio said. Rubio said he had not spoken with Kasich or made any arrangements with him. His proposal is similar to what 2012 Republican nominee Mitt Romney called for in a recent anti-Trump speech. Romney said voters who want to prevent Trump from claiming the nomination should vote for Rubio and Kasich in their respective states. Aides to Kasich gave no indication Friday that the governor would return the favor by encouraging his supporters to vote for Rubio in Florida. Rubio said voting for Kasich or Senator Ted Cruz in Florida, which also holds its primary on Tuesday, amounts to a vote for Trump. 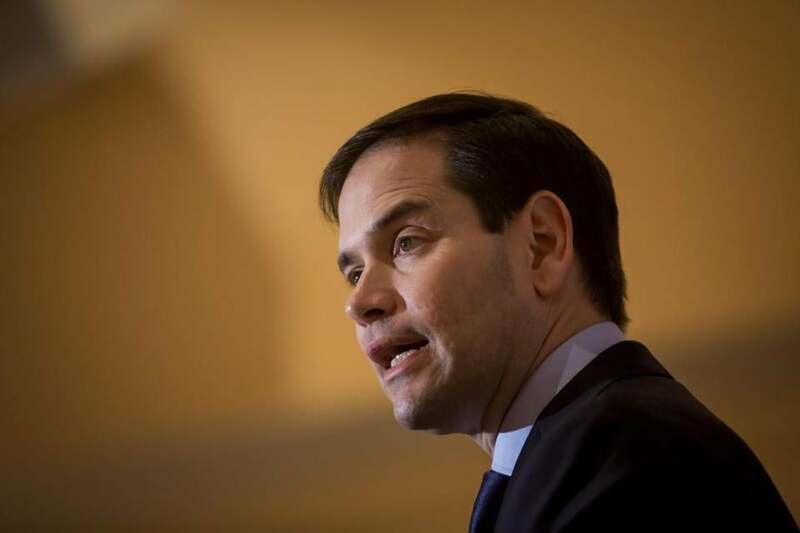 ‘‘The only one that has a chance to beat Donald Trump in Florida is me,’’ said Rubio. Polls show Rubio trailing Trump in Florida and Kasich in a close race with the mogul in Ohio. Rubio has collected only two wins so far so Florida’s winner-take-all contest could be his campaign’s swan song if he doesn’t win. Rubio made his remarks Friday at a Jewish temple here where he reiterated his concerns about Trump’s knowledge of foreign policy. Trump said at a St. Louis rally on Friday that he ‘‘doesn’t quite get’’ why some people preferred the more mellow performance he delivered in Thursday’s debate, without his usual personal insults. He said the other Trump is more exciting. Missouri is among five states holding primary elections Tuesday. Trump has amassed 459 of the 1,237 delegates needed to claim the Republican nomination, followed by Cruz with 360, Rubio with 152 and Kasich with 54.